These cruises offer passengers their own private island for a day. Admit it. There are times when you wish you could get away from it all by moving to your own private island.Well, some cruise passengers actually can – at least for a day. 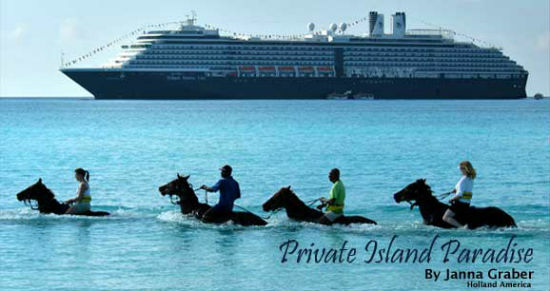 Each of the following cruise lines below offer passengers a day of fun in the sun on their very own private island. For many cruisers, this stop is the highlight of the trip. After all, what could be better than sitting on a white-sand beach, drinking a piña colada and soaking in the rays without crowds? Many of the island buildings look brand new — and they are. In 2002, the company invested more than US$ 21 million to turn this 140-acre (0.5 km²) slip of land into a destination their passengers would never forget. Nature trails wind through the isle, which is home to wild chickens, peacocks and occasional iguanas. Those seeking solitude will enjoy the hammocks that are hung under coconut trees in quiet locations. 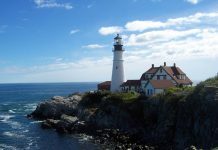 Sea lovers have plenty of activities to choose from. Hop on a jet ski (US$ 95 for 50 minutes) and speed across waters so clear that you can see orange starfish 20 feet (6 m) below, or don a snorkel mask and explore life under the sea up close. For a great view of the island, try your hand at parasailing (US$ 79 per hour). You’ll soar 200–400 feet (60–120 m) in the air and maybe even take a cooling dip in the water before returning to the boat. Disney knows children, so it’s no wonder that they feel right at home on Castaway Cay. The cruise ship docks right at the island (other cruise ships use tender boats to ferry passengers back and forth), so youngsters can head right down the ship’s ramp and out to explore Castaway Cay. There is a beach just for families, and Scuttle’s Cove is a safe and fun club for children. Parents need some time on their own, so there is Serenity Bay, a secluded beach for adults. For a little pampering, have a relaxing massage in the open-air cabanas at the seaside spa. The soft ocean breeze, the sound of the waves and an expert’s soothing touch are just the thing for leaving worries behind. Teens can get into their own adventure on The Wild Side (US$ 35), an excursion that includes snorkeling, biking and kayaking. Families who want to adventure together can try the Seahorse Catamaran Snorkel Adventure (US$ 49 adults, US$ 29 children). This easy 45-minute sail takes you out to calm waters and unspoiled coral reefs. Even younger children will enjoy floating in the turquoise Caribbean Sea with schools of bright-colored fish. Visitors to the tiny islet of Motu Mahana (Polynesian for “sunlit island”) are greeted with the sounds of Polynesia. 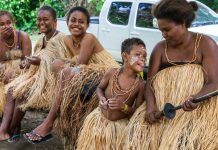 Les Gauguines, an eight-woman song and dance troupe, perform beguiling love songs in their Polynesian tongue while guests enjoy a scrumptious feast under the shade of thatched huts. After lunch, guests can relax in the sea or wade for yards in the shallow waters while waiters wearing bathing suits offer tropical drinks to those in need of refreshment. Try out the complimentary water sports like kayaking or snorkeling. For a different experience, board a motorized outrigger canoe and head to the beautiful island lagoon of Taha’a. Taha’a is known for two things: producing vanilla and black pearls. Guests can take a four-wheel drive tour into the hills to tour the vanilla plantations (US$ 65) or view French Polynesia’s rare jewel, the black pearl, at the Motu Pearl Farm (US$ 64). From there, head to the lagoon for some quality time with the region’s underwater fauna. There is even a small “lagoonarium” where rays, turtles, sharks and fish are enclosed in four different pools. 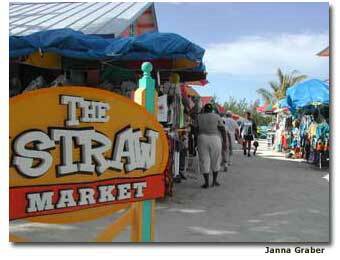 The Straw Market at Royal Caribbean’s CocoCay offers authentic Bahamian crafts. For some reason, picnics always taste better at the beach. Princess Cruises throws a huge BBQ, complete with three bars and live music, on their private slip of land in the Bahamas. Located on the southern portion of Eleuthera Island, Princess Cays is two miles wide and over 100 miles (160 km) long, offering plenty of room to explore. You can take an aqua bike out onto the turquoise waters (US$ 25 per half hour), or sail a Hobie Cat along the white sand shoreline (US$ 50/hr). Once home to the Lucayan Indians, Great Stirrup Cay is private getaway for Norwegian Cruise Line passengers. Covered with sea grape, coconut palms and other lush vegetation, this northern-most island in the Berry Island Chain is a beautiful place to play beach volleyball, go hiking or simply sleep in a hammock under the trees. With an average temperature of 75 degrees Fahrenheit, you’re sure to enjoy the experience. If you’ve ever dreamed of riding horseback in the waves along a beautiful beach, then Half Moon Cay is the place to do it. The 2,400-acre (9.7 km²) Little San Salvador Island is home to specially trained horses, allowing guests a unique way to explore some of the island’s scenery. Most of Half Moon Cay is still untouched by man — so unspoiled that the Bahamian National Trust has designated the island a Wild Bird Preserve. The isle’s other 45 acres (0.2 km²) have been turned into a delightful playground for guests. Smaller children can don pirate hats and hunt for hidden treasure with Club HAL’s pirate adventure (US$ 24), while teens can relax on their own private beach (US$ 29) ― no adults allowed. 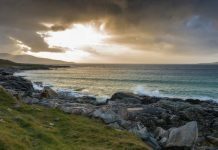 There is a West Indies Village reflecting the region’s Spanish, Dutch, English and French colonial themes and a two-mile (3.2 km) beach for those who simply want to take a dreamy stroll. Romantics can say “I do” or “I’d do it all over again” at Half Moon Cay’s Spanish-style chapel in an idyllic ocean-side setting. Those searching for adventure can snorkel (US$ 16) with stingrays in the new stingray lagoon or try to land a big one while deep-sea fishing (US$ 119), a catch-and-release experience. Like any other port, these private islands have different personalities but one common goal: to give cruise guests something to write home about. You’d better bring extra postcards.